We've had a bear visiting our apple tree/yard for the last few nights, so the kids have been very interested in bears. 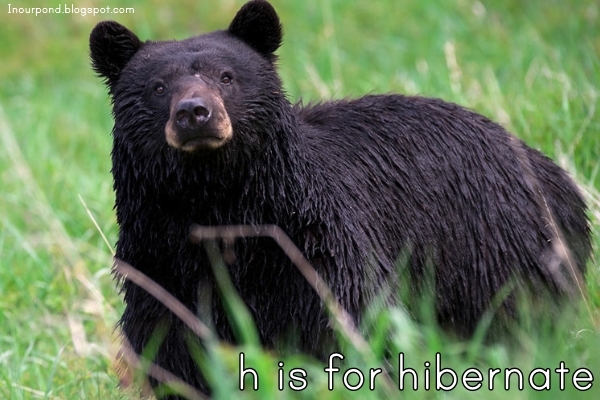 This week, I changed my lesson plans to include a theme about bears, hibernating, and foraging. The weather has turned cold and cloudy, so it was a great day for some hibernation. 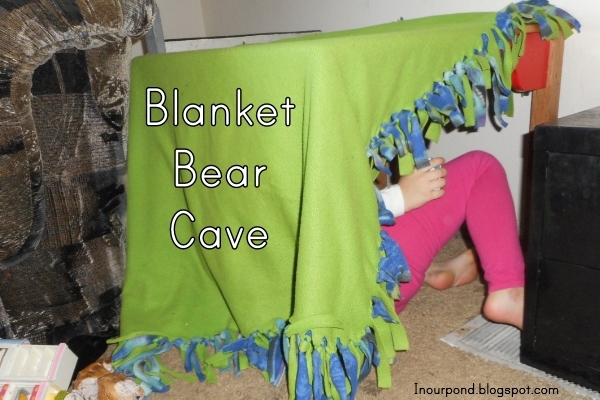 The kids built themselves a bear cave by putting their blankets over the kids' table. It worked pretty well, and they learned a few things about how to build a fort that holds together. All the books and talk about hibernating (as well as the dark skies) must have put them in the mood for a long winter's nap. Tadpole slept four hours and Skimmer and Dragonfly napped for three hours. I got to do a lot of crafting. I taught the kids a song today called "Five Little Trout" It has the same tune as "Five Little Monkeys Swinging in a Tree." The words are "Five little trout, swimming in a stream. Telling Mr Bear, 'You can't catch me.' Along came Mr Bear as quiet as can be... And snatched that trout right out of the stream." I made it up but the kids liked it. We played a "chasing" game called "Mommy and her cubs." I'd stomp around the room saying, "I'm a mommy bear looking for my cub." When I caught one of my kids, I'd hug them tight. I taught them that a mommy bear won't let anything come between her and her baby. I reminded them that I wouldn't let anything come between us either. I hope they learned that their mother's love is strong and that they should stay away from a bear mommy with her cubs. Before naps, the kids had goldfish crackers for a snack while I read bear books to them. I really enjoyed "Winter Lullaby," which goes through different animals and talks about whether they find a place to sleep (hibernate) or move to someplace warm (migrate). We had Bible study in the morning and a playdate in the afternoon. It was a really big day! I ordered some Schliech bears from Amazon, so the kids have been playing with those all day. They've been in the dirt, in the bathtub, and in the leaves. Today was another big hibernating day. They're still carrying around the bear toys and playing with them. The only "bear" preschool thing we did today was eat a "bear snack" of goldfish crackers and dried berries. I really hope you know what a comfort it is to see your lessons that are simple and real. I struggle in staying motivated to do "homeschool" for my two very active preschool age boys because everyone else's lessons and activities seem so perfect. I hope you don't find my comment insulting. Anyway, thanks for sharing your fun activities. We made bear caves and watched your bear video today. Thanks again for sharing your family fun with us. Yep, life with preschoolers hardly ever goes as I plan. Mainly, we read books, talk about the way things work, and spend lots of time playing. I'm glad that my realism gives you some easy activities to do with your kids. You can check back about once a week for more inspiration.